While most of the ABIM Examination topics fall neatly into organ system categories, not all of them fit into this schematic. 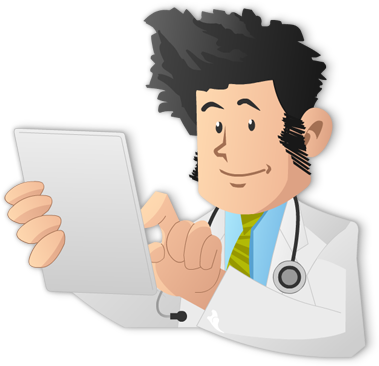 These include: primary care screening guidelines, substance abuse, vaccinations, etc. Here at Knowmedge, we’ve incorporated this important group of subject areas into General Internal Medicine, similar to the American College of Physicians’ Internal Medicine In-Training Exam Blueprint. Earlier this week, we reviewed the 5 key eye diseases seen on the ABIM board and NBME shelf exams. Today we explore the high-yield topic of vaccinations. 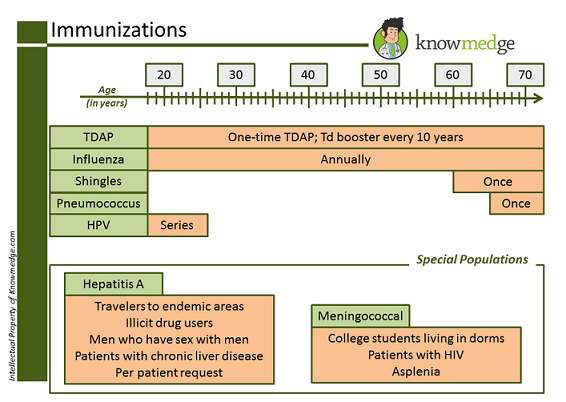 Administer Tdap to all adults who have not previously received Tdap or whose vaccination status is unknown. Boost with Td every 10 yrs. All individuals age 6 months and older should be vaccinated yearly since the targeted influenza strains changes on a yearly basis. Adults 60 years of age and older should receive a single dose of the zoster vaccine. This is regardless of whether the patient has had a prior episode of herpes zoster. The vaccine is approved by the Food and Drug Administration (FDA) for patients 50 years of age and older, at this point, the CDC recommends the vaccination beginning at age 60 years so stick with this guideline. Patients with severe immunodeficiency should not receive the zoster vaccine. All adults 65 year of age and older should be recommended to have one-time vaccination against Pneumococcus. Pneumococcal vaccine should also be given to younger individuals who are current smokers, nursing home residents, or have asthma/COPD, diabetes mellitus, chronic renal failure, chronic liver disease, chronic cardiovascular disease, cochlear implants, anatomic asplenia, or alcoholism. Both males and females ages 11-26 are recommended to undergo the full series of the HPV vaccination. The vaccine is not recommended for use in pregnant women. The exam is several months away so go ahead and bookmark this page. That way, you can quickly review vaccinations once more in the days before you take the General Internal Medicine section of the med school clerkship shelf, ACP in-training and ABIM board exams.